CONGRESS AUTHORIZED 15 PORT PROJECTS TO DREDGE DEEPER AND WIDER SHIPPING CHANNELS: The Army Corps of Engineers' spending plan includes $56 million for projects at the ports of Charleston, Jacksonville, Port Everglades, and Boston as well as the Sabine-Neches waterway in Texas ports. Trump budget provided $108 million for dredging in the ports of Boston and Savannah. The US Army Corps of Engineers will be distributing $56 million for dredging. Savannah officials say the Trump budget offers only is half of what they need for their project. 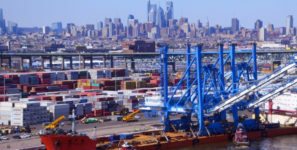 Two seaports in the United States will be the sole beneficiaries of allocations in the budget introduced by the Trump administration recently for fiscal year 2018 that starts October 1. That document provided $108 million to be split between Boston and Savannah. But other US ports won’t be completely left out in the cold. The US Army Corps of Engineers will be distributing $56 million for dredging that have already been approved by Congress. Congress has authorized 15 port projects to dredge deeper and wider shipping channels, but Trump’s proposed budget slashed the number of projects markedly. Of course, the administration doesn’t have the last word, as it is Congress that ultimately approves the budget and allocates the money. Ports on the east and gulf coasts, especially, are in need of deepening their harbors thanks to the expansion of the Panama Canal which allows much larger ships through the waterway to those ports. Most of those ports have waterways that are too shallow for the big ships to navigate unless they carry lighter loads or travel at high tides. Dozens of ports are looking for dredging money, which experts say will costs $4.6 billion to accomplish. State funds are also available for these purposes. The Army Corps of Engineers, which recently released its spending plan for discretionary funds approved by Congress, includes over $56 million for projects at the ports of Charleston, Jacksonville, and Port Everglades, as well as the Sabine-Neches waterway that serves three Texas ports. Boston also received $18.2 million in Army Corps discretionary funding. Those projects are going to get an immediate boost while Savannah may have to wait for over a year before it sees its dredging dollars. Officials in Savannah say the $50 million offered in the Trump budget is half of what they need to keep their deepening project on schedule. The state of Georgia contributed $266 million to the Savannah River project which the port spent up front. South Carolina allocated $300 million in state funding to the port project, but the federal money from the Army Corps of Engineers was also welcome.